After my earlier post on Steamed Pandan Kaya Layered Cake (click here for recipe) which has received an overwhelming response, I am pretty sure that this moist and tasty Steamed Chocolate Cake Steamed Chocolate Cake 蒸巧克力蛋糕 recipe will be another keeper for my readers. 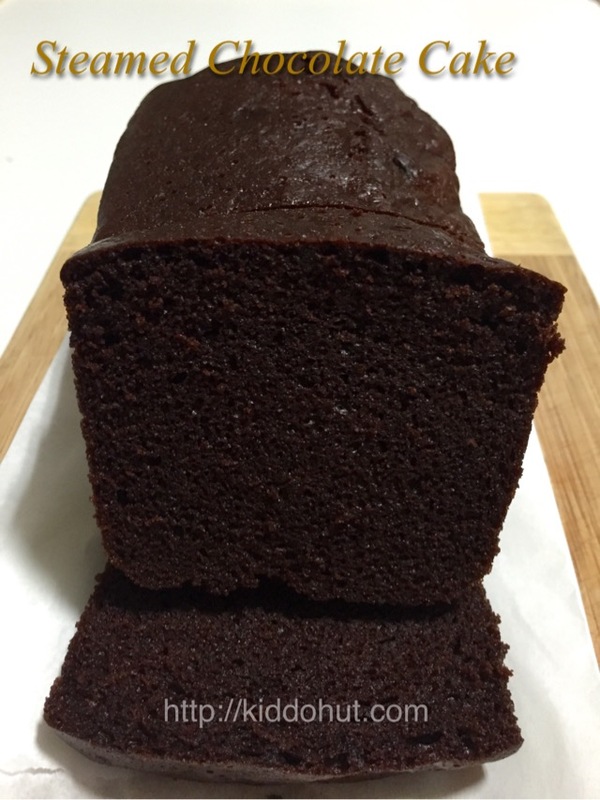 I could vividly remember the taste of the Sara Lee’s chocolate pound cake which was a great hit during my time when I was young as our frequent breakfast item. Wrapped in an aluminium tin with a paper cover, the cake was moist and tasty. Unfortunately, it was a baked item and I don’t have an oven to make one. 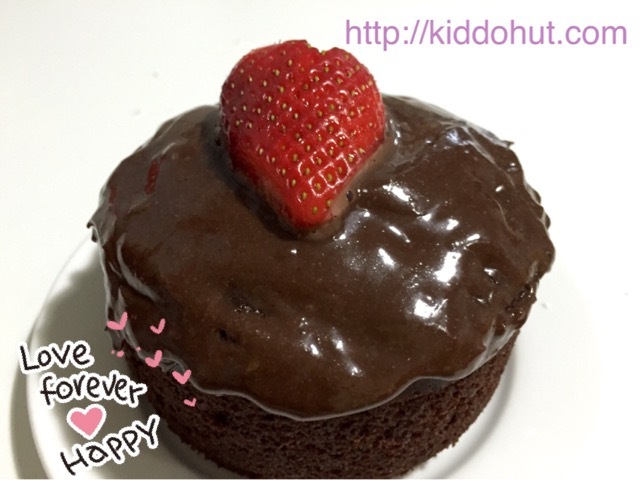 Chancing upon this steamed chocolate cake recipe, finally I could reminisce the nostalgic taste. I would say, this steamed chocolate cake is much better than that. A cuppa of dark coffee or tea would be a perfect combination! Valentine’s Day is just two days away (or one day away while writing this post), with all readily available ingredients in my kitchen, this becomes a perfect gift for my husband. I did the chocolate fudge topping mainly for decoration purpose and to fix the heart-shaped strawberry. Otherwise, eating the cake on its own is just good. Of course, this topping is definitely welcoming for those who really love a lot a lot of chocolate 🙂 Else, you could try putting some whipped cream and scatter some grated chocolate onto the cream. I have adapted and modified the recipe from Cooking Crave. I have reduced the sugar and the sweetness was just right. In addition, I was lacking caster sugar so replaced with brown sugar (红糖). The taste wasn’t being affected mainly due to the immersing chocolatey taste. 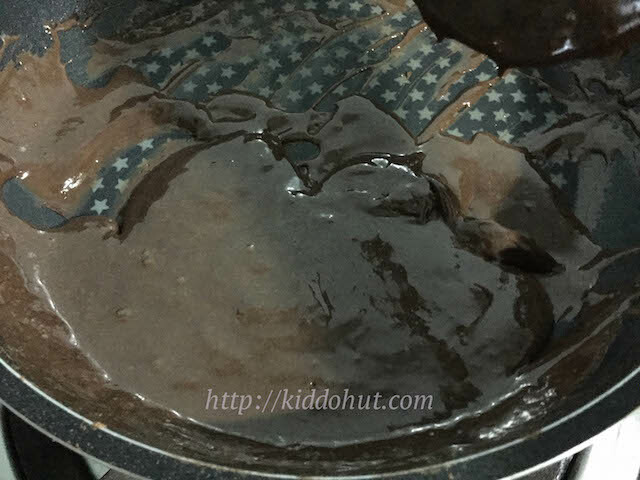 If you do not have an oven like me, or wanna a quick sugar fix in the middle of the night or simply crave for chocolate cake and too lazy to go out and buy, why not try this recipe? You will be in for a surprise that it tastes better than a baked one. 1. Add butter, caster sugar, evaporated milk in a saucepan and stir over low heat until sugar has dissolved and butter has melted. 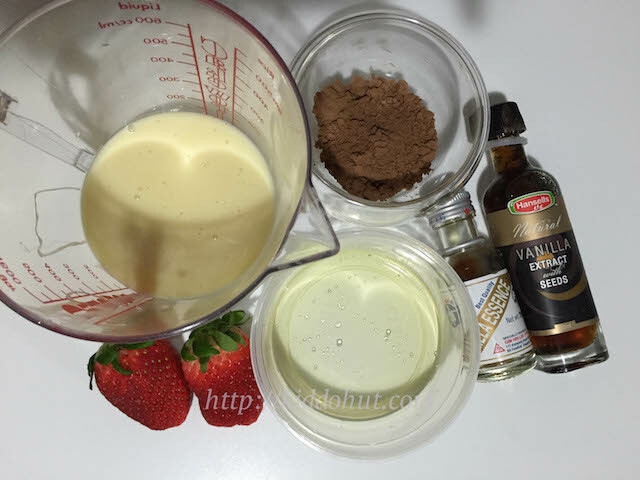 Add vanilla essence or extract. Set aside to cool. You may cool it under fan to expedite. 2. Add the slightly beaten eggs into the earlier mixture and stir till well mix. 3. 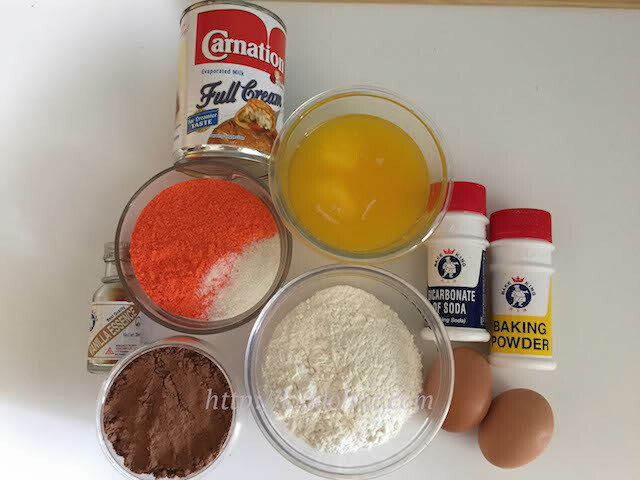 Sift the flour, cocoa powder, baking powder and baking soda into the mixing bowl of mixture and fold in well. 4. Grease the aluminium tin and pour the batter in. Fill up to 75% to give allowance for the cake to rise. Cover loosely with aluminium foil. Puncture small holes at the four corner of the foil to allow some air circulation within yet no water vapour can drip in. 5. Steam for 45 minutes over medium heat. Cool the cake in pan before turning out to serve or for decoration. 1. Mix the cocoa powder in the condensed milk and cooking oil. Heat under low heat. Stir while heating. 2. Add salt and vanilla essence/extract. 3. 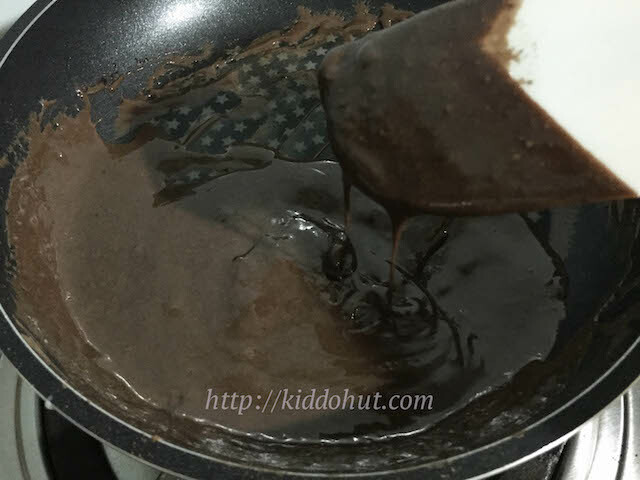 Once the chocolate fudge has reached the desired consistency or thickness, off heat. 4. Cool the topping for 30 seconds and spread it on the cake. Decorate with sprinkles, fruits or nothing. 5. Chill the cake in the refrigerator before serving.